Want the thrilling feeling of staying in a log cabin with awesome mountain views? 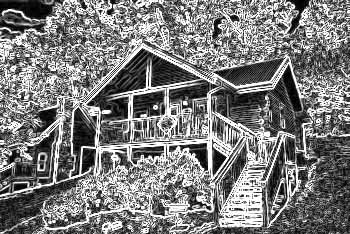 Then Bear Cove Falls Resort cabins near Dollywood in the Smoky Mountains are the choice for your vacation! Not only do these cabin rentals in the Smokies boast a prime location close to Dollywood, Splash Country waterpark, and the Pigeon Forge parkway, but these luxurious cabins come complete with resort amenities as well. Discover why these Smoky Mountain log cabins with views are the choice for your vacation rental! These Smoky Mountain cabins are some of our most convenient cabin rentals near Dollywood. This prime spot ensures you can spend whole days playing in the theme park. All that time spent driving from a further cabin location can instead be spent riding fast rollercoasters or beating the summer heat at Dollywood Splash Country. On top of being only a few minutes away from Dollywood, our Bear Cove Falls cabins offer spectacular views of the Great Smoky Mountains. On clear days, guests can easily view Mt LeConte in the horizon from cabin decks and porches. You won't want to miss waking up to a beautiful mountain sunrise coming over the high peaks of the Smokies! Can you imagine a better way of enjoying a cup of coffee before a fun-filled day at Dollywood in Pigeon Forge? This resort location near Dollywood also keeps guests close to other great local attractions along the 15 mile long Smoky Mountain parkway. Even better, Bear Cove Falls Resort allows easy access to the 18-hole Gatlinburg Golf Course that is perfect for a relaxing day of Smoky Mountain golf. By booking online with Cabins USA Gatlinburg, you will receive an additional 15% discount on your cabin rental! With this special offer, you can find the perfect cabin for your lodging at an even better value. Cabins USA Gatlinburg is the choice for quality cabin rentals in the Smoky Mountains because we make your vacation experience our priority. Come experience "Almost There," a 2 bedroom luxury cabin that sleeps 8 guests and comes with a resort pool, hot tub, game room, and a 15% cabin discount! "Flying Bear" is a bear Cove Falls Resort cabin with outdoor pool access, a hot tub, and a 15% cabin discount in the Great Smoky Mountains! Bear Cove Falls golf view resort pet friendly cabin in Pigeon Forge overlooking the public golf course and less than a mile off the Pigeon Forge Parkway. Snuggled Inn is a 2BR pet friendly cabin in Pigeon Forge with swimming pool access accommodating our four legged friends and up to 6 guests. Affordable pet friendly cabin near Gatlinburg in Bear Cove Falls Resort Pigeon Forge. Just off the Pigeon Forge Parkway near Dollywood with pool access. Sundaze is a beautiful 3 bedroom Pet Friendly cabin in Pigeon Forge near Dollywood with swimming pool access. Book online for immediate Cabin Special! "Big Mack Lodge" is a premium 5 bedroom cabin near Pigeon Forge in the Bear Cove Falls Resort area comes complete with a theater room and pool access! "Bear Cove Lodge" is a lovely 6 bedroom cabin with resort pool access, a hot tub, theater room, game room, and a great location near Dollywood! Come experience "Crosswinds," a beautiful luxury 6 bedroom cabin in Bear Cove Falls Resort in Pigeon Forge with a pool, hot tub, theater room, game room, and 15% discount!